Finance Minister will chair panel to look at the challenges in a fast-changing global economy. Amid a global economic slowdown, the first task at hand is to continue to create a vibrant economy, newly appointed Finance Minister Heng Swee Keat said yesterday. This is important as it creates good job opportunities and new businesses, said Mr Heng, who will also chair a new committee on the future economy. “With a growing economy, we can then generate the resources to invest in our future, invest in education and take care of those in need,” he said. His remarks were made during a visit to the start-up community at JTC LaunchPad @ one-north as well as packaging firm Fagerdala yesterday – his first event since he was sworn in as Finance Minister on Thursday. Mr Heng’s appointment to lead a committee tasked to look at the future economy had been announced by Prime Minister Lee Hsien Loong at the new Cabinet’s swearing-in ceremony. The economy was in urgent need of a review, Mr Lee had said. Singapore is operating in a rapidly changing global economic and financial environment, Mr Heng noted. While Singapore is restructuring its economy and some important policies have been put in place since the last Economic Strategies Committee report in 2010, a review of the overall situation is needed. He said: “We need to do an assessment now to see what are the key changes in the global, regional and domestic economies. What are the challenges ahead, where are we today and what are the key things we need to do going forward? Elaborating on some of the challenges, Mr Heng noted that the financial conditions have been volatile, especially in recent months. Regional economies have been adapting different and shifting policies towards growth, with China, for example, undergoing structural adjustments recently. Changes in Europe and the United States will have an impact as well, he added. In the domestic economy, an important change is slower growth of manpower and the ageing population. “The aspirations of our young people are different, and we will have to continue to create the opportunities for them to fulfil those aspirations,” said Mr Heng. 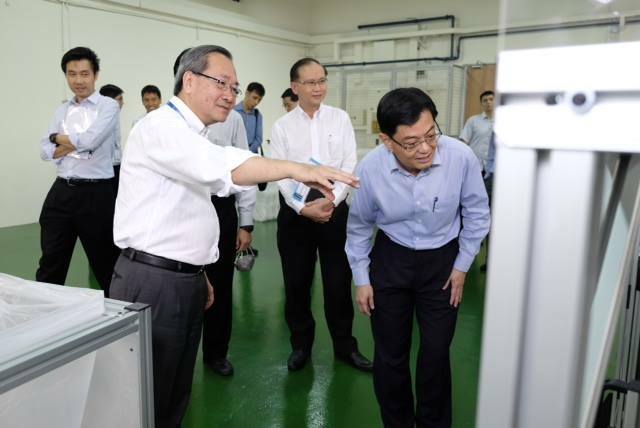 During yesterday’s visit, Mr Heng also gave a hint of the approach he will take in his new role. To understand the effect of global and domestic changes, he said, “an important place to start has to be at our companies… where the action is, the front line”. But an aspect he will certainly consider is that “the economic cycle is getting shorter and changes are happening faster”. As for how Singapore might remain relevant, he said: “The move towards higher skills, higher productivity, an innovation-intensive economy is, I believe, the right way to grow. ลิขสิทธิ์ของ 2017 Fagerdala Singapore Pte Ltd.